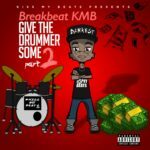 Breakbeat KMB is a prolific dynamic performer who has boldly put the drums at the front of the stage. Often imitated but never rivalled, This is a stamp in history by a revolutionary rockstar mind. Breakbeat has been pioneering an organic amalgamation of melodic rap, infused with catchy hooks, all whilst providing his own live drums simltaneously and cutting edge production live onstage. Hailing from UK, East London, Breakbeat started his musical journey digging through his Fathers vinyl collection and listening to his Mother record vocals. Some of his earliest memories recall him sitting on a Caribbean porch watching his Father play bass, whilst he made a kite out of ice lolly sticks. Years gone by with meticulous practising, he started playing drums for local steel band and gospel choirs. Whilst honing his craft, by the tender age of 18, Breakbeat was then offered a spot being the musical director for Fame Academy winner David Sneddon, . This included Tv spots with Top of the Pops, CD:UK, Opening for Bryan Adams, Elton John. Recording on the album Seven years and Ten Weeks, which was recorded at Townhouse Studios with Elton Johns Band. After continuous playing, This is in turn led to work with John Legend, Kanye West, Raheem DeVaughn and Estelle. 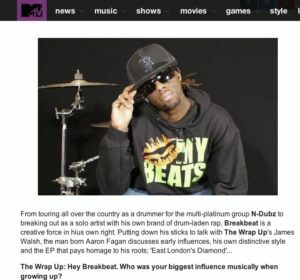 Breakbeat has also toured alongside UK Grime sensations Skepta (BBK Boy Better Know), Chipmunk, Dappy & Tinchy Stryder. 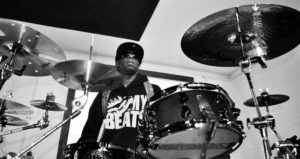 Breakbeat has solidified experience playing to sellout audiences in the UK and worldwide. and has also toured alongsideSWV, Montell Jordan and The Black Eyed Peas. 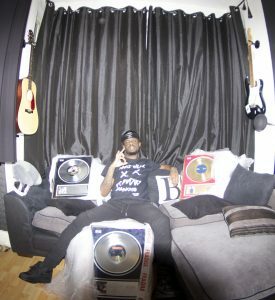 Breakbeat has also co produced “Wavy House” By Lord Of The Mic Grime veteran Jammer, appeared inWretch 32s “Be Cool” Video, Frisco (BBK) Ft Shakka “Different Kind” video. 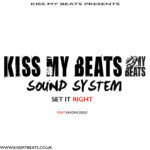 An entrepreneur in his own right, Breakbeat has expanded Kiss My Beats into a multi-functional brand that appeals to the diverse, cool and trendy youth of today. Whether it is his own material, beats, production, musical direction, or bespoke fashion pieces, Breakbeat has found his niche in providing a commercially viable product, whilst voicing relevant issues facing todays youth. 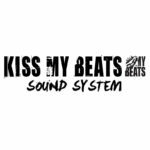 The KissmybeatsVEVO page was opened in May 2016, to provide an even bigger platform to outlet different projects. Breakbeat also utilised the output of the UK music TV station “Channel U” (Channel AKA) (Iconic in Helping to break Dizzee Rascal, Kano,Lethal Bizzle etc), pushing a number of videos on screen such as,Standing Tall, Heaven, Takin Over. The most notable being “Give The Drummer Some” which spent 10 weeks in the top 20 chart holding the number 2 position (Only to be held off the top spot by Island artistDevlin). The video also ranks Top Tier on Youtube searches. Amassed views total to over 1,000 000, with his own page standing at over 500,000 profile views. During this time period Breakbeat circulated a very healthy 100,000 self pressed units of his mixtapesoffering through his commitment to the hustle and grind of independent promotions at performances throughout the UK. When asked what separates him from the plethora of artists in today’s market you will hear a charismatic riposte from the guy who calls himself East London’s Diamond. “I make universal music, music to connect with people. Whatever situations people may going through, I aim to inspire and give an insight into my world. Music is my life. I produce, write, record, mix and engineer. All of these tools allow me to carve out different sounds, energies and emotions. There is no one like me, I am Breakbeat.